Oh hey a stray apostrophe. It’s a dynamorphstrophe, it punctuates in unusual places. Please don’t judge me, but dilettante is leaping to my mind for some reason. I can spin this positively – Brad just hasn’t asked what her major is and knows she’s in the college of liberal arts and sciences, and she isn’t going for a BS. Yeah, that’s the ticket. Positive spin achieved. She wants to understand the world and its problems better. There are a wide array of humanities and social sciences courses that can contibute to that, and I can see Alison not wanting to limit herself to a single perspective, and seeking to gain insight on society from multiple dimesions – philosophy, sociology, poli sci, economics. It would be a terrible strategy if she were relying solely on her major for employment after graduation, but she’s not (given what we’ve learned about her financial situation in this chapter, she may never need employment). Given her objectives, it’s a reasonable strategy, and the one followed by a lot of the world’s great thinkers up through the 19th century. It’s only in the last 50 years that society has started despising any course of study that isn’t directly vocational. Another excellent page! I hadn’t thought of Alison as a great public speaker but in retrospect it seems appallingly obvious given that she’s eloquent and has been super famous for a while. Which leads me to one of the recurring questions I have about this comic: why is Alison not hounded by reporters and droves of screaming fans?! Does anybody have a hypothesis? My first thought is, sometimes things die down after a while, and even things that seem like they’ll be at the forefront of public consciousness for a very long time stop getting much attention pretty fast. Which also means the reporters and fans where everywhere at first, but we picked up with Al quite a while after her retirement. Second thought – most fans may be respectful of her privacy, enough to keep their distance; and most reporters and, especially, paparazzi, may have some fear of violent reactions if she feels harassed. Third thought – I don’t know if it would really be all that interesting? After all, she’s far from being the only Biodynamic, even if she was the most famous one for a time. And while her act of removing the mask and revealing her identity and retiring was a huge, huge deal, her life without the cape isn’t that interesting, she’s basically another college student. (Then again this would only strengthen the idea of ‘she’s violent and dangerous’). So remember the first X-Men movie when Jubilee asks for a cure to being a mutant and Storm barges in and is grossly ignorant and disrespectful of everybody whose power causes them a daily disability (Jubilee can’t touch people without hurting them) by saying they should all reject the very idea of a cure and take pride in their mutations, not realizing she passes as human without trying and isn’t discriminated against for what she looks like? And the movie treated it like it was a rousing and glorious message? I hope Alison has seen X-Men, too. Imagine the spike in academic and political discussions over the superhero genre the coming-of-age of the biodynamics must have caused. “Cyclops Was Right” is probably considered hate speech in the SFPverse. Pretty sure that’s Rogue, not Jubilee. That’s the third one, and it’s Rogue, not Jubilee. I think there’s a distnction between powers that ”inherently” make life worse for the person who has them, like Rogue’s, and powers that affect a person’s appearance in a way that society rejects. In the first case, the power itself is a genuine problem; in the second case, the problem isn’t with the power itself, but with society’s reaction to it, and the objective should be driving society to accept other appearances, not making everyone look “normal”. It’s roughly analogous to the difference between being disabled versus facing racial discrimination. Though I recognize that’s a fraught comparison, because plenty of people with what are generally regarded as disabilities are strongly opposed to the idea that they need to be healed or fixed (the most common arguments on those lines seem to relate to autism and deafness) – which actually makes it the closest analogue that exists in our society to the mutant “cure” debate in X-Men. But at least in the comics – and I haven’t been a reader for some decades, but I’ll assume this is still cannon – a lot of mutants are not high powered, but still highly stigmatized. And it’s not just about *stigma* – Rogue isn’t the only mutant who has powers that are more of a burden than an aid. In medicine there is a concept known as autonomy vs. beneficence – how much are you going to allow the patience to choose for themselves, and their own idea of what is best of them, vs. how much are you going to choose what is best for them assuming that you know better. I am not saying there isn’t a time and a place – intervening in suicide is probably the one I will make the strongest personal argument for – but I’m always wary of the paternalism implicit in beneficence. In this case, the argument seems to go that because people have been stigmatized, they now lack the wherewithal to choose for themselves… and I find that troubling. You mean Rogue? Jubliee has firework powers and didn’t show up in the movies until Apocalypse. That was Rouge and the third movie actually (I’m sorry, I’m that nerd! ), though the point is valid. She took the cure at the end for a reason, and it was a valid one. Though to the movie’s credit*, it didn’t present her view as the clearly correct choice, rather it showed how that was a very complicated situation with no clear answer. As to Allison… I don’t think she’s intentionally gonna say anything dismissive of their lives and experiences as Dynamorphs, but she could very easily make some blanket statements or such and create a very awkward situation. If so, I hope this is one of the cases where she deals well with disagreement. Ehhhh… is it really your place to be talking at this convention as an honored guest, Al? Kind of reminds me of inviting a man as a keynote speaker in a conference about reducing sexism in the workplace. Isn’t it sexist to assume that only women can face sexism or discuss it? Safe spaces are not about saying allies can’t contribute to the conversation, but allowing the concerned people to self-actualize, which is so, so, so much harder than we realize. She was presumably invited. This is Brad’s iffy idea, I think. I’m not debating whether or not she’s an ally. She’s clearly highly supportive of the dynamorphic community, and good on her for that. I’m just saying that in a group meant to bolster support for and amplify the voices of dynamorphs, having a non-dynamorph as an honored guest can detract from that, especially considering the real-world precedent of men/white people sticking their foot in their mouth while in the same position at conferences meant to support women/people of color. 1) I am not debating whether or not Al is an ally to the dynamorphic community. She clearly is doing what she can to support Brad in his endeavors to create this community. Good on her. 4) But maybe this isn’t the case! Maybe Brad sent out an email to all these people saying “You want me to invite Allison Greene to come speak about her experiences working with dynamorphs?” and got the overwhelming response of “Yes!” Cool. Great. What’s important is what the people in that crowd think will support them, and if they thought this was a good idea, good on the whole situation. There a shooter in the crword I know it. I was just thinking that! I was waiting for a bullet to pancake on her forehead and for her to glare at the guy before whipping him off into the sky for questioning. Are those CAPECAKES that I spy on the table? Should we be worried about Capecakes slowly but steadily taking over the world of snacks? Is this some kind of EEEEEVIL subplot that’ll come to bite Alison in her invulnerable behinds? Wow. Young lady going to college and then experienced hyper/dyna planet class diplomat. I’d vote for her to be president with Lady Mormont as VP. Hey, look, more comments refusing to cut Allison an IOTA of slack. It’s really fun to think about the necessary ramifications of this universe to end up in one where the X-Men comics never existed, a primordial condition to not have everybody drawing up the parallel constantly. But it’s just that, fun, not very important in essence. I feel that it doesn’t invalidate my point, but you’re right. That’s really the last thing I’d wish them to be. I agree, the idea of making a group of people who mostly have powers that elevate them above the common man a reflection of opressed people was always deeply flawed. Her background is far more complex and mixed than that. Is one woman really capable of speaking for the experience of all women? No one is capable for speaking for anyone except for themselves. If a someone stood up for me, no matter their race, gender, or wealth. If there was someone who has no experience with what I went through, but showed empathy and understanding, I would appreciate it. I imagine many people would. Instead it seems that people are focused on their differences instead of what binds them. It’s true, no one can ever understand you, and they will sometimes have incorrect ideas about your life and struggles. But doesn’t that go for everyone? No matter how much they are like you, they aren’t you. The group of people who work and speak alongside you would be very small and unnoticable. It is important to embrace outsiders who are empathic to you. Not to tell them to sit passively in the corner as some sort of decoration. Outsiders should be encouraged to take an active role, to speak alongside with you, even if they sometimes make mistakes. More voices can reach more people, and if other outsiders see people like themselves interacting with your group and being appreciated, it will make them more likely to accept and even help you. Of course it will always be important for outsiders to listen to and prioritize the group they are helping, but it’s the words that are being said that matter, not per se the person saying them. The hardest struggle for people fighting for equal rights is to convince others that they are like them. That they are humans too, that should be allowed to live and work aside them with the same rights. You simply can’t do this if you seperate your group from the rest of the world. Please don’t. Been there, I didn’t. Real world experience is that allies have a silencing/chilling effect when they try to participate in minority-focused events. Regarding the chilling effect of allies, has it been determined what the factors behind this phenomenon are? Is it preventable? Is it inherent to the social context? Can improvements be made upon this? I also think that outsiders should be granted the opportunity to risk making mistakes, so long as there is a way for them to be taught how to do better which doesn’t tax the people who they are learning from. It hardly affords them the opportunity to improve if they are not afforded the chance to be wrong & then shown how to be less wrong. And participation tends to be a prerequisite for this. We don’t live in a meretricious society, but life-long education is inherently a merit-based task. Even when it comes to learning about folks that have felt the heaviest effects of a society that doesn’t fairly value their merits. I think it is worth pointing out for readers that “Standing up for others, as an outsider” is not the same as “trying to advance the group’s interest” nor is it necessarily synonymous with “standing up for a category of others.” Oftentimes it is an individual standing up for a few others, rather than an entire group of politically recognized others. Deaf children can’t have full hearing. Implants aren’t perfect and can cause intense pain. Much like hearing aids they don’t make hearing better, just louder. Separating your deaf child from deaf culture removes them from people like themselves. That removes a huge chunk of support. My older brother is almost completely deaf in one ear and 40% in the other. He no longer wears hearing aides because they caused him so much pain. I can only imagine how horrible it could be to have that tech permanently implanted in his head. At the moment medical science is just not there yet despite all the so called success stories. There is a reason they don’t show you how most of those children are doing years later. Besides living near St.Augustine and the school for the deaf and blind has taught me that most of them don’t want implants. They just want to be treated like people. Just like how as an Autistic with anxiety and depression I’m sick of how people see us as disposable. I just want to be treated like an adult thank you very much. Just because I am different doesn’t mean I want yo be talked down to like I’m less than an animal or screamed at and shamed for harmless things I can’t control.Or murdered or tortured. In Florida it is legal for teachers to grab autistic children and slam them to the floor for any behavior the teacher doesn’t like or electrocute them. Many parents have murdered thier autistic children for “being burdens” and gotten off for that or very light sentencing. I’ve been beaten, sexual assaulted and in one case a relative tried to kill me all because of my autism. The most common form of therapy for autism is extremely abusive. Please look up why ADA is so harmful. I lucked out that my parents stood up for me as a child and pulled me from bad situations as soon as they realized what was going on. We are perfectly fine the way we are. Please stop trying to force us to be “normal”. By the way a so called “cure” is impossible because you can not rewire how someone neurons function. Autism is how your brian develops over time differently and is permanent. Any group pushing for a cure is scamming you out of your money. Recent studies are starting to confirm a genetic link similar to down syndrome as well, seeing as I have a handful of autistic relatives I personally belive this. Please stop making judgements on how people should live with disabilities you don’t have. Especially without talking to anyone who is a part of those group. It’s very harmful. I agree now, but if we had some kind of magical cure that 100% works and has no side effects like the ones you listed then we absolutely should make it available to as many people as possible. That’s just another simplification of the issue where the movie analogy falls apart if looked at closely I feel. Deafness? If we did come up with such a thing it would be great though I would hope it would be optional. Forcing it on people would be horrible. Autism? If I recived a so called cure I would be a different person. Pretty sure there are thousands of horror movies/books showing that mankind as a whole fear the possibility of having thier minds rewritten for the comfort of others. I’m fine as I am. I hope people give up on this false hope of a cure. It’s really terrifying when you think about it. Yeah, that’s basically what I meant. Thanks! I’ve heard a lot of infantilizing of paraplegics, and it continues to disgust me to hear about. It feels like people have some sort of internalized desire to deny anybody the dignity of being capable of doing adult things when they view an individual as less capable of doing a given thing. Erm. I’m not sure I’m okay with making a judgment of the ways oppressed people choose to struggle against oppression from the vantage point of privilege? Especially considering that all the dynamorphs are going to be around 20. The choices people make are anywhere from effective to ineffective regardless of how righteous or sympathetic said choices are. Among other things, I am acknowledging that oppressed people can make immature choices or engage in counterproductive tribalism. Just like non-oppressed people who opt to do so on their behalf might engage in. Your caution is an appropriate thing to do, seeing as determining these fuzzy sorts of things are difficult to specifically accomplish. But my choice to voice my conclusion is a result of me being comfortable with the idea that I may be wrong, that I may be corrected, and that I may be persuaded to make use of better premises & conclusions. Cool. I hope you’re equally prepared to sound astoundingly arrogant and where and how that could drive that conversation. If you were a speaker of, lets say Welsh, would you bring your children up to speak Welsh, or insist that they learn only English? Is ASL/BSL/whatever really so lesser a form of communication? You might want to examine what it is about your view of deafness that compels you to put _deaf culture_ in scare quotes? As soon as you say ‘autism is iffier’, you admit that there is a case to be made in general. And shouldn’t the decision be down to the people with the lived experience, rather than the rest of us making the decision for them from a position of uncomprehending privilege? I will note that the neurodiversity position on cures is nuanced (I’m talking the #ActuallyAutistic position, not the horrendous _kill them all, let god sort it out_ position of Autism Speaks). People don’t want their neurodiversity cured, it makes us us, but they’ll happily consider more specific cures for stuff like sensory overloading. >Is ASL/BSL/whatever really so lesser a form of communication? Verbal communication doesn’t require that the target of communication already be focused on the person with the message. Messages can be communicated without breaking concentration on what you are doing. You can use your hands while speaking. The spoken language of a country will be understood by almost every single resident. So I’d say yeah, english is better. That’s why we don’t all use ASL instead. Spoken Language has a greater level of function for a variety of tasks & contexts that society values than Sign Language to be sure, but better is a loaded word which presumes certain values over others. As is the word lesser. I think that exploring which values are warranted & which ones aren’t is going to need to be settled before any sort of common ground on languages which function differently can be reasonably reached. You just fell into the trap of judging something different by the basis of ‘normal’. Your argument relies from the fact that sign languages are not spoken, and thus their differences make them lesser. But you neglect to bother understanding how the differences can be a positive. Ignoring how signed languages can be used in places where spoken languages can’t (loud environments, underwater, et al), signed languages also have the advantage of being three-dimensional. This increases the complexity of the language, and adds capabilities not seen in spoken languages. An obvious example is within directions which are dimensionally precise. None of that ‘just off to your left’.. and you still get lost. Signed languages can tell you exactly where to go. That’s just one example. Difference does not make lesser or better. It just makes it different. There are advantages and disadvantages to difference. The true answer is not in picking winners or losers, but in embracing the diversity. This lets us gain from them all, instead of just the subset of the ‘winner’s’ abilities — and lacks. Yet the evidence shows that people with mental health issues are far, far more likely to be the victim of crime than the perpetrator. The point is that this would be no longer true if said people could actually start earthquakes at will. Why? There’s a presumption built into your statement that any mentally person with a weapon _will_ use it. Should we also assume that any white man with an AR15 will inevitably commit a massacre? Why do you hope this crowd rejects her? Why should they reject an ally? Wow. Utterly screwed up on that comment. I actually meant “they don’t reject her out-of-hand.” I guess this is why proof-reading is important. As far as the Storm thing goes, I kind of remember the comics once saying the reason she doesn’t use her powers the way you suggest more often is because her powers aren’t CAUSING weather so much as moving around where it happens. For example, if she stops a hurricane from devastating New Orleans, the air pressure will switch around so it forms off the coast of Hokkaido or something like that instead. That explanation, unfortunate, doesn’t wash too well based on events in the comic. Once upon a time, she was.. well, let’s call it encased in metal. She caused a huge hurricane that covered roughly the upper two thirds of the east coast of north america. It was noted in the comic that a weather pattern like that had to be unnatural. One writer also had her use her weather powers to wipe the storage devices of digital cameras once. The degree of control necessary for that has never been hinted at before or since. I will concede that she has has to get the energy from somewhere, which is likely to impact weather events elsewhere, but it would lower the energy of those, not just displace them. Yeah, that’s more what I was going for. I think most of the Dynamorphs will be courteous individuals like Brad, but it would be weirdly funny (not to mention sticking with the tone of the chapter) if some of them resented Allison for being there. So far Allison is totally within the bounds of what’s polite at any minority group event, when you’re an ally but not one of the in-group. Glad to be there, shout-out to her friends in the group, support for what they’re doing. But if she overstays her welcome at the mic or tries to preach at them, Brad should step in as moderator and transition to whoever the scheduled speaker is. Is the division really that clear cut? Is it really impossible to imagine courteous individuals who still would resent that the first speaker at their event would be the literal flagship of indisputably positive biodynamic powers and that as such she might have, despite all the best intentions in the world, no idea what she could be talking about? Yes, naturally, there could be those who object without trolling as well. Rogue. Rouge is make-up used to redden cheeks. There’s so many things wrong with that mentality. First thing, it’s a great comic so there’s no reason someone with a different viewpoint can’t also enjoy it. Also it’s ‘not sexism against men’ It’s sexism and happens no matter who it happens to, and to say otherwise is just silly. Sexism is globally institutionalised prejudice against the equality of women. You may occasionally find a situation in which a man is treated less favourably, but it isn’t institutionalised, never mind worldwide, so it isn’t sexism. Item 1: Sexism against men. Doesn’t exist, because sexism is not just interpersonal animus based on gender. It is a system, built over centuries, that privileges men and oppresses women. Same goes for racism, homophobia, ableism… you get the idea. If a man suffers a negative effect because of his gender, that is not sexism because it is not the same as a women suffering as the result of a massive system that has been constructed over centuries to oppress her. Item 2: You’re reading the wrong comic. Allison has spent her entire life fighting what she thinks are the bad guys, only to realize that the systems put in place to make these bad guys happen – sexism, poverty, classism, shady government organizations that kill anyone who can actually do something about those systems of oppression – are remaining firmly in place. Now, Allison’s trying to do something to dismantle those power structures. She’s still figuring out how, and we’re all figuring it out with her. So to suggest your diverse viewpoint is in any way compatible with the message of this comic is just plain silly. Allison is fighting exactly the idea you’re supporting: that systems of oppression are in any way equivalent to interpersonal, isolated incidences of harm. I guess it’s possible to read this and get something else out of it, but that’d kind of be like reading the New Testament and taking away from it, “Man, Jesus really walked a lot.” You’re missing whole point. I think another apprehension of the comic and its message is not of systems of oppression in the established sociological understanding, but rather systems & biases which divide people, which in turn leads to the establishment of oppressive societal structures as well as a number of factors which further incentivize the prevention of cooperation among divided people. Perhaps that is the viewpoint that they are espousing? I guess it doesn’t necessarily matter if it is. Consider also, the process of reading the comic could perhaps lead to an understanding why the comic is necessarily promoting the view of systems of oppression and the challenge of dismantling them. Such an understanding could lead to people discarding incompatible views in favor of compatible views. 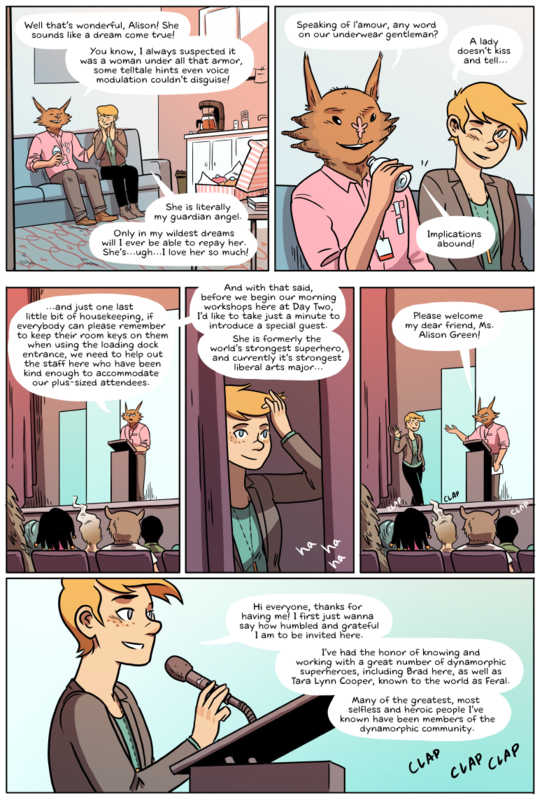 How plausible do you consider the following: An unjustified belief (interpersonal sexism against individuals is somehow part of the same mix of sexism as institutionalized sexism against a category of individuals) might change as a result of reading a webcomic that challenges it. I’m biased because webcomics have changed my mind, so it’s no surprise that I consider it a reason to not consider that people with incompatible views are reading the wrong comic. They may miss the point for some time, but people’s thoughts are malleable. There’s no reason to treat Etveck like they actually believe that institutionalized sexism exists against males on anywhere near the level of oppression that it occurs for non-males. Only that they believe that interpersonal sexism against males exists, and that they may not have made a few connections about the wider picture that you easily made. Seeing as it was not specified in the above clause if you think there’s such a thing as sexism against men it would be terribly easy to make the mistake that this about interpersonal sexism, especially if Etveck is much more familiar with the less academic definition than the one that actually fits your declaration coherently. The fact that you even differentiate the two in your reply shows that a distinction ought to be made so as to avoid confusion. I consider it bad form to appear to understand your opponent’s mistake and then lecture them for doing something else that such a mistake precludes them actually doing. But I am very much in agreement with the substance of what you are arguing for, if not the bits and pieces I’ve been a stickler over. I have the view of racism and sexism that i’ve always had, which is that it is just a singular person’s disdain of another race or gender purely because of the circumstances of their birth. What they are, not what they do. But to avoid getting in to an argument about semantics I’ll take a second and look at it through your definition of it that’s come out of nowhere. I’m not saying women don’t and have never faced sexism, they do. (Just as an aside where does the idea that racism and sexism are institutional come from? I’ve always known it was a personal level of bigotry.) The way I see it is that both Men and Women face issues in society that need to be analysed and considered. For example in the US I’d be i full support of a proper maternal leave system to be put in place. For Men in cases of domestic abuse they deserve to be given fair treatment by the police. I see no point in the assumption that society at large is biased against one group of people more than another, the productive thing to do would be take every issue in mind without bias. On the topic of that comedy routine, on top of not being very funny It’s a rather flawed argument. The sentiment is along the lines of “Jokes about white people are okay because they are the right punching bag.” That just writes off all white people. So making jokes about white people as a whole is ok because they have more privilege? Oh sure that homeless guy down the street is doing so much better than this guy making jokes about white people in front of an audience. So much better. When it comes to reading this comic I find it is great on so many levels, even if I disagree with some of its messages. For example the scene where the stats are brought up in relation to Moonshadow murdering people. And the network of heroes whose goal is to protect women when they feel unsafe. I find that’s not a great solution. Men are more likely to be mugged or assaulted on the streets than a Female is actually. But on top of doing very interesting things with the setting of superheroes it is looking in to some societal issues from the interesting angle of trying to solve the problem. Alison finds herself hopeless against the weight of trying to solve all of the worlds problems, and I find myself rooting for her. It’d be like telling a non religious person they are wrong for reading the bible or the quran, because they don’t already agree with the base tenants of them. I don’t mean to be hostile so sorry if I came across like that, I just think your original post about This isn’t your place to be speaking here Alison is counterproductive to a discussion. Everyone should be included in the discussion in my opinion, just like Alison is here, just as I would want Men to be included in discussions about Womens issues I would also want Women to listen and help when Men have issues. Segregation is not a good solution to issues that predominately affect a single group of people. I’m curious, why would that be? My experience of folks with (i’m going to call them disabilities only because it’s easy and my posts are often overly long already) disabilities is they typically break out into two camps – accustomed and reasonably cool and funny about their issue, or seriously bitter. The latter group is, again, in my experience, far smaller than I would expect. The vast majority are very mature and cool. I’d like to hear more on what the I can’t say what it’s like for the rest of us, being compared with Megagirl all the time, she’ll be hurt/I’ll be mortified/etc entails. “Being compared with Megagirl all the time” is the notion I understand the least. Who is doing the comparison? Wider society? Alison herself? The conference by having her share her experience? I hear what you’re saying- totally. I understand that often, I may be guilty of ‘privilege blidness’ myself, but at the same time, I don’t understand. I’ve _never_ (though that is a dangerous generalization, I realize) put down or overode someone based on -isms- I’ve done so to people based on my own ego concerning our relative perceived intelligences, but never on the basis of race, gender, sexuality, any of that. Of course, I’ve been in a position where I’ve had the chance to learn in a safe, stable environment, that may be the result of past expressions of ‘white privilege’, so there is that. See, I’m of the opinion that, while there certainly are still situations where folks are oppressed in one way or another due to various factors, so very much of that has its roots in past actions that no longer apply, and the efforts people put forwards to correct those past injustices in the present do more harm by reminding people of the terrible situations of the past than they do in correcting the relatively lesser injustices of the present. Awareness must be spread, yes, and children must be taught better, but true equality I think is a generational thing- you’re not going to be able to change the minds of those who’ve already decided to be racist, sexist, faithist, etc., and forcing their wrongness in their face only engenders bitterness and an urge for revenge that can then cause them to further the cycle of oppression more than if they were allowed to just quietly stew in their prejudice, by pushing them to counter-express their prejudices in situations where children can witness it and consider it a valid worldview. What about those you’ve over-ridden just by speaking, without ever realising it? Minority groups are pretty unanimous in saying that allies can be hugely silencing. Women in particular have said they have a huge problem in speaking up when men are dominating the discussion. Disability has had a huge problem with trying to eject allies from their dominance of disability charities, and it remains a problem in many areas, as seen with Autism Speaks, which is hugely dismissive of self-advocacy by autistic adults.There’s considerable evidence that the parents of disabled kids often have attitudes that are distinctly problematic towards, if not actively opposed to, the political aims of disabled adults (c.f. the recent campaign #crippingthemighty, which was specifically about the disability website The Mighty choosing to silence its disabled contributors when they spoke up about problematic articles and to side with the parents).. There has been a massive improvement in many areas of discrimination in my lifetime, but to presume that improvement is universal is, well, naive. We’re seeing a horrendous outbreak of racism here in the UK right now, even though we thought we had pushed that out to the fascist fringe. And before that it was disability, with society readily adopting government’s sly insinuations that we are all frauds and scroungers. And before that it was gypsies. And so on, and there’s no evidence other nations are different, just look at Trump’s statements wrt Muslims. WRT challenging discriminatory beliefs, we’ve seen time and again that we don’t make progress unless we make a stand in the face of discrimination. Think about Rosa Parks. See that’s the thing, you’re right in the objective abstract, and it may be a legitimate concern in two or three generations? The time it will take to get rid of the historical and cultural influence of some four thousand years of social hierarchy on the way we fundamentally function as human beings makes it so that for now, there’s basically no need to worry children will go the extra mile and treat traditionally privileged people as they once did the people they oppressed. I mean sure some might do of course but it’s substantially less difficult to fight when it’s a few individuals and not the resounding mark of human civilization. Agian you think cochlear implants are magical. You do realize this is a surgery performed when the children are too young to consent right? A major non emergency surgery. Normally doctors wisely push parents away from major non emergency surgeries until a child is old enough to decide for themselves because they are dangerous. Cochlear implants do not give you hearing the way we understand it. A cochlear implant is a surgically implanted electronic device that provides a sense of sound to a person who has a severe or profound hearing loss. A cochlear implant does not cure deafness or hearing impairment, but is a prosthetic substitute which directly stimulates the cochlea. There are over 250,000 users world wide; 12,000 in the UK. The expectations of how well a cochlear implant will help someone hear have to be addressed prior to implantation, as although the device can help the person hear better and detect environmental sounds, it is not as good as the quality of sound processed by a natural cochlea and therefore will not restore hearing to normal levels. … It’s a more advanced hearing aid and needs to be treated as such. Denying a child a right to decide on a major and non emergency surgery is wrong. Allowing them access to the deaf community gives them access to other people who share thier lived experience. I also want to add that every deaf person I have ever met knows thier native language but not every one of them were allowed to learn sign language despite the fact that it counts as a second language. (Very useful in noisy environments) Many of them have been taught to speak as well as possible for the comfort of non deaf people. I’m not sure why you dislike deaf people so much but please don’t pretend it’s possible to give them hearing on the same way you experience it. Not with a failure rate of 5% added in. TGT: Why do you want to operate on my leg again? TGT: Will I be able to walk afterwards? Ah, so I see where this miscommunication lies. It can indeed be read from my words that I’d view those that I disagree with as immature. This is not what I expected to convey. I said that immature people which do things which I disagree with exist and their actions have had an effect on Stephanie Gertsch such that she expects a disproportionate amount of people to induce backlash upon Alison despite Alison doing nothing to meaningfully inflame. I was noting that the expectation of behavior was absurd, and such an expectation is due to exclusively absurd people. I was not explicit as to what the behavior that I disagree with even is, so it’s pretty obvious that I should do so now: I disagree with the begging the question fallacy wherein what Alison said is concluded to be a negative message because one of the premises of viewing the meaning of her words is that she will say insulting, condescending, ignorant or any other number of unpleasant adjectives to describe the content of her words due to her status as being an out-group member. Such behavior is not only irrational, but also immature in my evaluation. Her position of privilege may explain a hypothetical ignorant thing that she could say, but her position of privilege does not guarantee that she has already said it simply by expressing her cogent personal experience. The second miscommunication is also obvious in hindsight, my words can be read as being dismissive of the very concept of identity politics. What I intended to convey is that people can & do abuse or misunderstand how to apply important concepts to buttress their own flawed arguments. Valuing identity politics does not inherently preclude getting along in the world. However, valuing identity politics more than rational behavior, does end up precluding such from time to time. I was opaquely directing my rhetoric to speak of people that do that sort of thing. Antagonism of those that obliviously cause discomfort so as to punish them for causing discomfort rather than antagonism of those that obliviously perpetuate ignorance with the purpose of driving awareness towards what is not okay and why it harms people that are often socially invisible. The latter is necessary, the former is just a distracting thing that happens because emotions are messy things & people seem to enjoy witch hunts because they’re much easier than actually applying pressure to achieve greater social equity. Why I assumed that other people would follow my very subtext dependent train of thought is silly. It’s clear that I should have made the target of my ire very specific rather than depend on the generalized assumption that since *I* know that I’m talking about silly people that do silly things in response to a person who is wondering why they anticipate a silly thing to happen, that all the information is available to everyone. I have not said this. And I’m not going to speculate as to how the structure of my rhetoric has led anyone to this particular misinterpretation. I was indicating a difference between anger which doesn’t get things done, and anger which does get things done. To elaborate: Expressing justified anger is not necessarily expressing anger which gets things done. Witch hunts are definitely a form of expressing anger, but they don’t get things done, they reinforce existing avenues of bias and in-group out-group behavior by means of scapegoating. Being disruptive can and is a way to get things done, but not all forms of being disruptive can be expected to achieve this, and even if attention is gathered, one still has to have arguments of substance in order to make use of that attention so as to get things done. Anger is practically a necessity to getting anything related to social inequity done, as the existing pillars of systematic exploitation need little else but to depend on an absence of fight in one’s spirit to have people fall prey to accepting a lack of dignity. Indeed it would be. But as I hope I’ve indicated above, I’m not doing that. I wouldn’t dream of it. But I take no offense to these statements directed at me, as they are precisely the things I would want to be taken to task for had I been that sort of presumptive jackanape. Even so, I expect there may be additional significant things worth criticizing my statements for, so I look forward to their discovery. Brevity may be the soul of wit, but it is not the ally of comprehensive communication. Not their views, their argumentation. Their choice to use faulty rhetoric to convey their views in an fashion which is flawed will cause damage in and of itself, my criticism of such flaws may have some additional impact on the relative advancement of their cause, but I don’t see how that is significant given that a bad argument will tend to attract criticism from every observant group which concerns itself with the use of effective rhetoric. Granted, I did a terrible job of making it clear that I was dismissing absurd behavior exclusively, but I would hope that my words at least suggested that I was dismissing something other than people’s views. You’re explaining things that the text were still to give to us. As per this page, maybe they had, maybe they hadn’t. As per the recent one, Brad admit having made a mistake. Actually, its the other way around. Cochlear implant advocates reject signed languages, period. Keep in mind that Cochlear Implants are basically advanced hearing aids — they don’t cure, and there are still hearing issues which are only ‘resolved’ through extremely intensive speech classes. Which might not work, leaving the kid WITHOUT any language skill at all. There is a limited window for learning language, so an ‘oral failure’ is PERMANENTLY deprived of learning and language. There is no making up for it. Deaf people embrace bilingualism, but where it fits. Signed languages for ‘spoken’ communication, and WRITTEN communication for English. Speech classes are often offered as well, as an option (it’s not really a skill that all deaf kids can learn). That was my thought as well, but that doesn’t address my other questions.